There are a lot of pieces of Pixel Heroes ($1.99) that would have had a much stronger effect on me a couple of years ago. The well-designed faux-retro graphics and sound, the roguelike elements, and the referential sense of humor are all things that have appeal for me, but even the marriage of these particular aspects is getting a bit too familiar to be exciting. That means the game has to carry forward on its gameplay, and it’s honestly a mixed bag. This is a challenging streamlined RPG that doesn’t take itself too seriously and offers a lot of replay value, but its repetitive nature and tedious combat eat away at the fun, bite by bite. 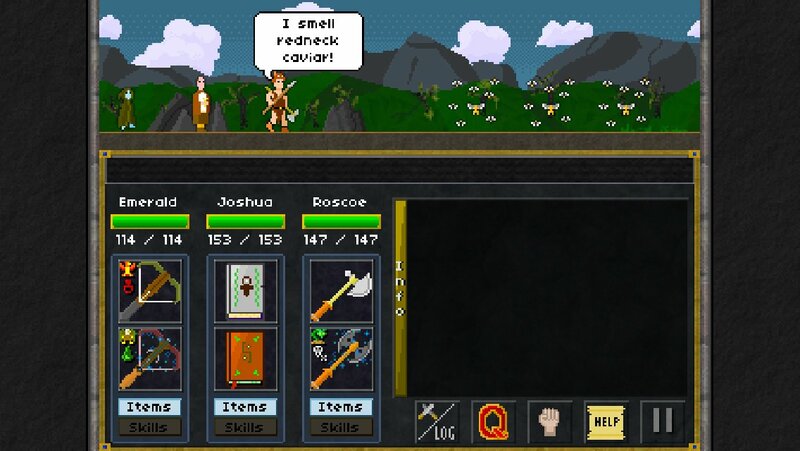 In Pixel Heroes, you choose up to three heroes to form a party and battle evil. You can choose from a wide variety of characters, though who is available varies from game to game. After you’ve got your group, you can head out into the town to find a quest and prepare for your journey. The town acts as a hub, with each quest leading you to a different location on the map. Your party will automatically make the journey, though there will be incidents along the way that you’ll have to play through. When you reach your destination, you’ll make your way through several rooms, one at a time, each with some sort of encounter in it. This culminates with a boss battle, followed by a return trek to the town. After collecting your rewards, do it again until you’ve finished all of the dungeons. The battle system is turn-based, with your side and the enemy side each getting a chance to use one character’s action per turn. You can’t use the same character two turns in a row, preventing you from leaning too hard on any particularly powerful move. The enemies don’t seem to suffer from that restriction, but that’s part of the challenge, I suppose. Each character has four possible actions they can take. Two of them are class-based skills with cooldown timers, while the others are dedicated to whatever items you might have equipped. Casters can use spellbooks, fighters can swing their weapons, bards can sing songs, and so on. It’s pretty straightforward, but there are tons of elements, status effects, and enemy strengths and weaknesses to consider. Combat can be pretty tense as a result, and if you don’t have the right equipment with you, it’s highly likely you won’t survive. If one of your characters dies, they can be revived through a couple of ways, though neither route is easy. Should your whole party wipe, however, you’re finished. The heroes will be buried in the graveyard, and you’ll have to start over again. This aspect, along with the somewhat random encounters and the huge list of loot you can find, gives the game a bit of a roguelike feeling, though it’s considerably less random and slightly more forgiving than the usual game in that genre. You’ll always know how many encounters are ahead of you, even if you don’t know what kind of encounters they’ll be, and the game allows you to play around with your gear and heal up after each one. If you have trouble in a particular battle because you didn’t have the right type of weapon, you can change around your equipment to see if you have something that works better for the next fight. Once you learn the weaknesses of the various enemies you’ll face in each location, it’s fairly easy, and eventually necessary, to exploit them. If you decide you’re not going to pay attention to any of that, you’re going to be in for a pretty rough time. Clearing certain stages, solving particular random events, and finishing quests will allow you to unlock new characters that might show up in the tavern next time you play. It adds a lot of replay value to the game, though there are certain parties who are going to have a very hard time finishing the game. You’ll always need to bring a healer of some type, for example, so you really only have two slots to play with. I like that in one way, because you never feel like you have every role adequately covered, making for fun strategies. In another way, having such a small party and absolutely needing certain things means you might not want to try out some of the fun alternate choices that offer less conventional ways to win. Either way, the drip feed of new character types ensures the game stays fresh for a while. Another strong positive for the game is its sense of humor. There are a lot of silly gags and references to all kinds of pop culture, both obvious and obscure. Many of the encounters ask you to make a choice, and it’s not unusual for at least one of those choices to be absolutely absurd. Characters will often express their feelings via little dialogue bubbles above their heads, and there are a bunch of simple, charming animations that add a bit more personality to everything. Not every joke lands well, but it throws enough out at a regular enough pace that the bad ones are pretty easy to forget. 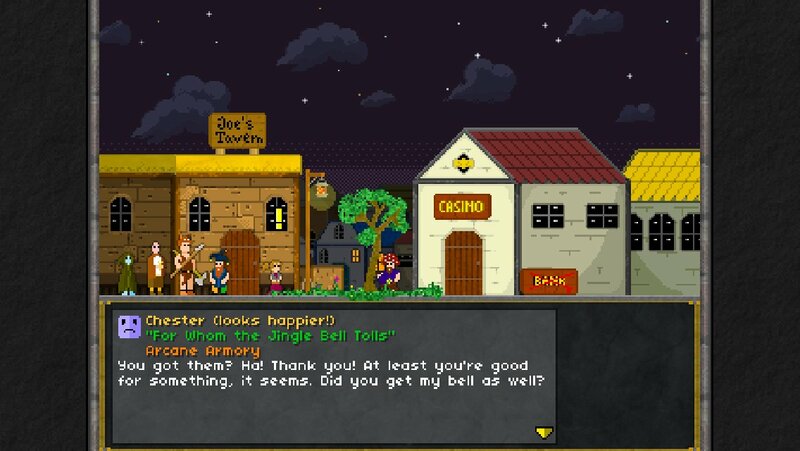 I particularly enjoyed how banal the quests you receive from the townspeople usually are. You’re often risking life and limb for things as stupid as a pair of underpants or the answers to a school test. I’m not sure if that’s deliberate meta-commentary on the RPG genre, but I’m going to count it as such. Incidentally saving the world while fulfilling a lazy villager’s fetch quest is the backbone of the genre, if you think about it. I also really enjoy the loot system in the game. The loot is all random, and uses a Diablo-like system of adjectives to modify each piece of gear you’ll come across. The only reliable things are the health potions, and you’ll want to keep plenty of those on hand to heal up between fights. Everything else can appear in various levels of quality, with or without particular elements, in magical or physical form, with certain buffs, debuffs, or status ailments attached, and so on. After every battle finishes, you can see it all flowing into your pack, and it’s really fun to dig in and see exactly what you got. Your inventory space is limited, though, so you’ll need to develop an eye for what is useful to keep, what is worth keeping to sell, and what is junk that you should just discard as soon as possible. The problem is that even with all of the loot, random encounters, and battle variables, Pixel Heroes starts to feel rote a little too quickly. You’ll die, then die again, and maybe die once more. Then, you’ll figure out what needs to be done and, luck withstanding, bury the game pretty quickly. There’s not much to the game beyond fighting and choosing the occasional option, and the fighting isn’t as satisfying as it needs to be to carry the game. Success is based a lot more on what kind of gear you have as opposed to your actual battle strategy. As long as you have a good selection of equipment and bring the right stuff into a fight, there’s not much else to do in battles except make sure you don’t run out of HP while you’re swinging like crazy. I like that you have to consider the order you ought to take out enemies, since picking off the weak ones only ensures the strong one gets to attack every turn, but it’s not quite enough. The game ends up being a roller coaster ride that starts fun, becomes frustrating, then gets enjoyable again until it cedes to tedium, taking one last-minute hairpin turn into frustration depending on your party build. Then you can do it all again with a different batch, if you want, but the road to success is going to be very similar, whether your team can follow it or not. 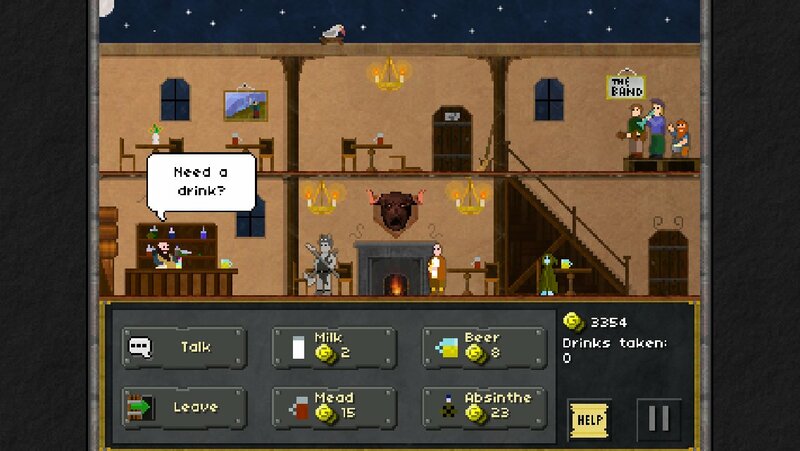 As something you pick up and play now and then, Pixel Heroes isn’t a bad choice. Given the sea of options on iOS serving just that purpose, however, the game doesn’t make a great case for itself over something like Cardinal Quest 2 (Free) or Adventure To Fate: Battle Arena (Free) that scratch a similar itch, but offer more variety and excitement.